It's shaken this Blues town - the loss of Bennie Smith and Henry Townsend in a two week period. 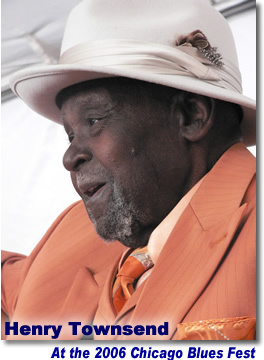 Henry Townsend was a national Blues patriarch, having recorded in the last 8 decades. Known affectionately as 'the mule', Henry was performing the craft he loved right until the end. The past few years Henry was flown around the country to perform with other luminaries such as David 'Honeyboy' Edwards, Louisiana Red, Homesick James, and Robert Lockwood Jr.
STLBlues was fortunate enough to have enjoyed his music and his friendship, as did so many in this musical town. We recently spent a few minutes with Henry, and as he shared some time with us he gave us some insights into his music, and his life - our interview. Henry, this town will never forget you, you were truly loved! I got a call around ten this evening from Art Dwyer. Henry had passed within the hour. Ever the road dog, he was playing this festival (see link) in Grafton, Wisconsin. One month shy of 97 and the old man passed working on the road. Ironically, one of his earliest recording sessions were done in a Grafton hotel, circa summer 1931. His first records were cut in Chicago in 1929. I knew him about half my life. He was a good friend. Tom Burnham Henry once said in an interview, "Blues is the truth". Henry was a consumate blues player and a true soul that touched all he encountered. I recall one year while down at the King Biscuit festival, a phone call alerted me that Henry was on the way, and could I arrange VIP status for him. Just one mention of his name, and the staff of the Biscuit couldn't have moved faster to lay out the red carpet for him. Just another example of how he was loved and revered. Henry leaves a legacy in his wake that spans the globe. I'm glad that I was able to know him, and call him a friend. Dave at STLBlues Been a pretty bad few weeks with the loss of the great Bennie Smith and the legendary Henry Townsend. St. Louis blues will never be the same. Good time for us to think about all the old musicians have given to us...and to take that knowledge and music into the future. RIP Henry and Bennie!